The last year I blogged mostly about Windows Phone stuff. This is not a surprise as I’m busy (on my personal time…) working for my 2Day todo-list application. I’m finalizing a major release that should be submitted to the marketplace soon with a ton of new features and improvement (several blog posts should highlight some topics from a developer point of view). 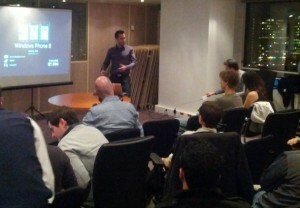 In mid-February, I will speak again during the TechDays in Paris. 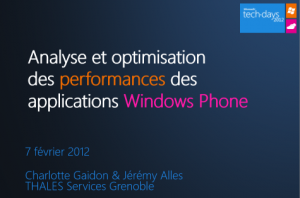 The topic is the same as last year: performance optimization for Windows Phone applications. However, with Windows Phone 8 we’ve plenty of new topics to cover ! In late-February I will fly to Redmond for the MVP Summit 2013. It will be my sedond time there. As aways, all the content will be under NDA… I will share a room with my friend Jose Fajardo I met at //BUILD/ 2011 ! I’m still deeply invested with 2Day so hopefully you should see more tips and tricks about Windows Phone. As a Windows 8 version is also on its way, that should give me many reasons to write new blog posts. Happy new year dear readers !